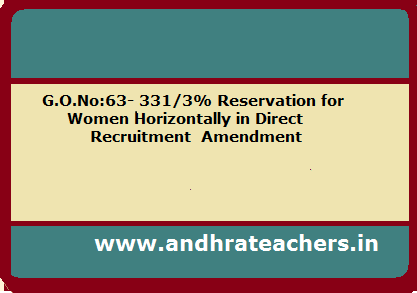 The Andhra Pradesh State and Subordinate Service Rules, 1996 – Amendment to Rule-22-A(2) relating to 33 1/3% reservation for Women Horizontally in Direct Recruitment to Public Services – Orders – Issued. an Public Service Commission held as follows:- ‘Social reservations in favour of SC, ST and OBC under Article 16(4) are ‘vertical reservations’. Special reservations in favour of physically handicapped, women, etc. 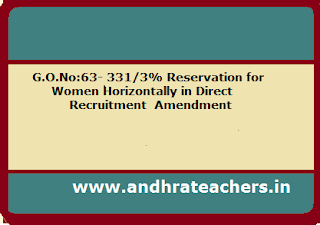 under Articles 16(1) or 15(3) are ‘horizontal reservations’’. Where a vertical reservation is made in favour of a Backward Class under Article 16(4), the candidates belonging to such Backward Class, may compete for non-reserved posts and if they are appointed to the non-reserved posts on their own merit, their number will not be counted against the quota reserved for the respective Backward Class. Therefore, if the number of SC candidates, who by their own merit, get selected to open competition vacancies, equals or even exceeds the percentage of posts reserved for SC candidates, it cannot be said that the reservation quota for SCs stood filled. The entire reservation quota will be intact and available in addition to those selected under open competition category. Open Competition, Backward Classes (Group-A), Backward Classes (Group-B), Backward Classes (Group-C), Backward Classes (Group- D), Backward Classes (Group-E), Scheduled Castes, Scheduled Tribes and Physically Handicapped and Ex-servicemen and Meritorious Sportsperson quota".